Without bees the world would look very different. Why are bees in decline, and what can we do to help them? We live in an amazing world filled with different organisms, ranging from tiny microbes to huge elephants. Many of the creatures (including us) that exist on earth depend on plants, as they represent an important source of food and - along with microbes - produce the oxygen that we breathe. Plants can be divided into one of two categories, angiosperms or gymnosperms, depending on how they organize their seeds. In angiosperms, the seeds are enclosed in flowers, while gymnosperms have no flowers and the seeds are “naked”. Pines, for example, are a classic example of plants with naked seeds. When talking about flowering plants (angiosperms), bees are vital. Bees are marvelous, as they are the major insect pollinators out there [1, 2]. Pollination is a crucial process, because it ensures fertilization of plant ovaries and contributes to the generation of seeds (and fruits!) in angiosperms. Awesome, right? This process contributes to the diversity among angiosperms. But wait a minute! Do bees work for these plants for “free”? What’s in it for them? Bees benefit from this exchange as well because they use pollen for food . This close and intimate relationship between bees and flowering plants is a win-win for both parties, as it enables diversity and reproduction in flowers and life-sustaining food for bees. Fig. 1 Bees are crucial pollinators for many flowering plants (Source: Wikipedia). Unfortunately, today the natural balance maintained by bees is in danger. A recent report by the United Nations Intergovernmental Science-Policy Platform on Biodiversity and Ecosystem Services (IPBES), states that more than 40% of the invertebrate pollinator species, particularly butterflies and bees, are facing extinction . This is alarming, as about 90% of all flowering plants in the wild depend on animal pollination, and bees contribute significantly to this process (up to 90% depending on the crops) . Products like chocolate, coffee and apples (Fig. 2) would no longer be available for us to enjoy without pollinators ! Habitat loss. This is likely the major reason why bee populations are declining. “Habitat loss” includes both habitat degradation and outright destruction. Global change. 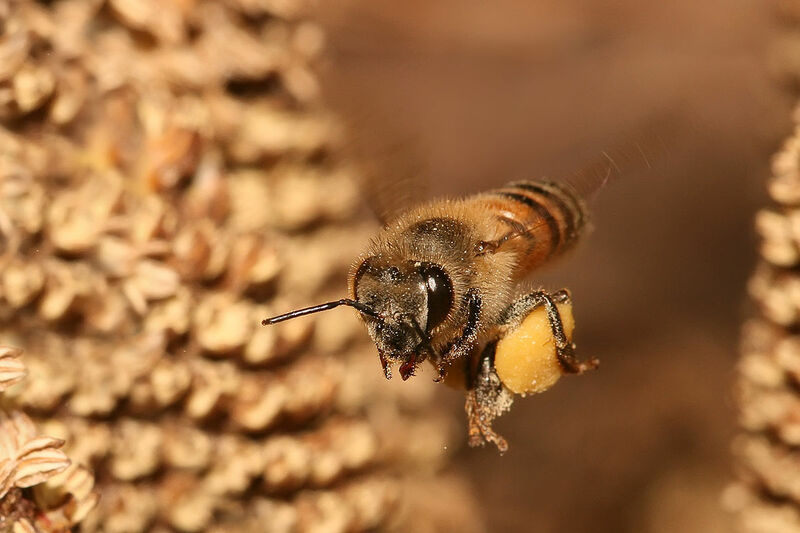 Although there are not conclusive studies, these authors speculate that fluctuations in climate are expected to affect bees, as, for example, bee shedding is very sensitive to temperature. Invasive species. Bees are in an environment because they can co-exist with other species. Animals, plants, insects, and pathogens (disease) that are not part of the traditional environment but were introduced there might have a negative effect on the bee population. Exploitation. Unregulated exploitation of bees, such as stealing bee products, affects them as it would any other animal species. Pesticides. When not applied or regulated properly, these chemicals can dramatically reduce crucial insect communities. Fig. 2 Products like apples depend on pollination (Source: Wikipedia). Because of the danger that bees are in, several organizations, such as Greenpeace, have begun to take action to save bee communities . We as individuals can also help the bees with very simple activities, such as planting flowers in our gardens, avoiding excessive pesticides, and leaving a small basin with water in our yards. Being aware of the important role that bees play in our local communities and around the globe will enable us to conserve them, to conserve the biodiversity of flowering plants, and to protect our food! Brown, M. J. F. and R. J. Paxton. “The Conservation of Bees: A Global Perspective.” Apidologie 40 (2009): 410-416. Delaplane, K. S., P. A. Thomas, and W. J. McLaurin. “Bee Pollination of Georgia Crop Plants.” University of Georgia Cooperative Extension Bulletin 1106 (2010). Kremen, C., N. M. Williams, R. L. Bugg, J. P. Fay, and R. W. Thorp. “The Area Requirement of an Ecosystem Service: Crop Pollination by Native Bee Communities in California.” Ecology Letters 7 (2004): 1109-1119. “Pollinators Vital to Our Food Supply Under Threat.” The Intergovernmental Science-Policy Platform on Biodiversity and Ecosystem Services (IPBES) (2016). “10 crops that would disappear without bees.” Fox News (2015). “Save the Bees.” Greenpeace (2016).